Harlandale Independent School District recently completed more than $8 million in unexpected building projects, paid for with savings the district achieved in its original construction plan funded by bond issues approved in 2006 and 2009. 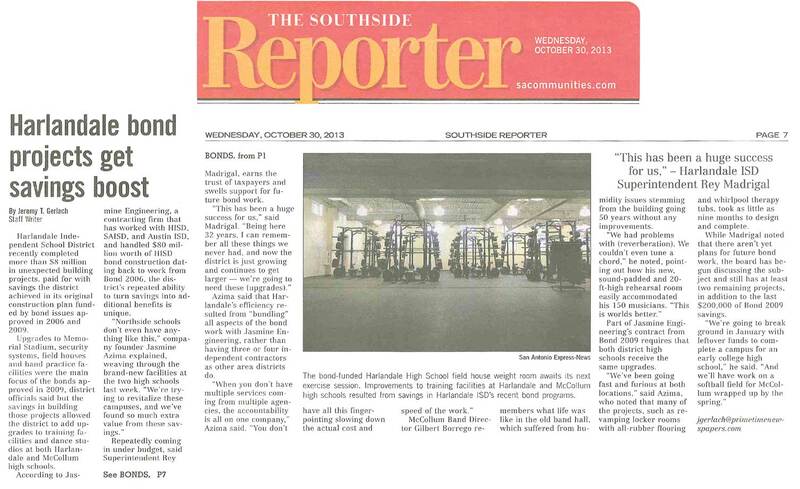 Upgrades to Memorial Stadium, security systems, field houses and band practice facilities were the main focus of the bonds approved in 2009, district officials said but the savings in building those projects allowed the district to add upgrades to training facilities and dance studios at both Harlandale and McCollum high schools. According to Jasmine Engineering, a contracting firm that has worked with HISD, SAISD, and Austin ISD, and handled $80 million worth of HISD bond construction dating back to work from Bond 2006, the district’s repeated ability to turn savings into additional benefits is unique. Repeatedly coming in under budget, said Superintendent Rey Madrigal, earns the trust of taxpayers and swells support for future bond work. Azima said that Harlandale’s efficiency resulted from “bundling” all aspects of the bond work with Jasmine Engineering, rather than having three or four independent contractors as other area districts do. McCollum Band Director Gilbert Borrego remembers what life was like in the old band hall, which suffered from humidity issues stemming from the building going 50 years without any improvements. Part of Jasmine Engineering’s contract from Bond 2009 requires that both district high schools receive the same upgrades. “We’ve been going fast and furious at both locations,” said Azima, who noted that many of the projects, such as revamping locker rooms with all-rubber flooring and whirlpool therapy tubs, took as little as nine months to design and complete. While Madrigal noted that there aren’t yet plans for future bond work, the board has begun discussing the subject and still has at least two remaining projects, in addition to the last $200,000 of Bond 2009 savings. View the article here or online at mysa.